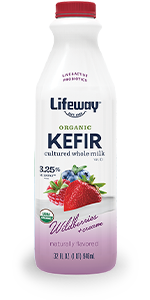 Our Organic Whole Milk Wildberries Kefir provides an oh-so creamy base for a delectable blend of sweet summer fruit. It’s a deliciously filling drink that can be enjoyed all year long! Combine all ingredients into the base of a high-powered blender and blend until desired consistency is reached. Serve immediately and enjoy! We love using mixed berries to get a variety of nutrients, but feel free to use whatever you have on hand.